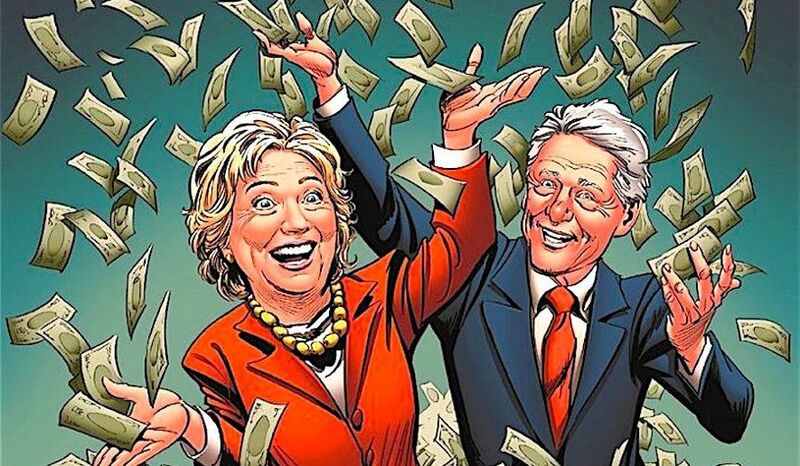 During the administration of President Bill Clinton, a time in which members of the news media — men and women alike — behaved like giddy schoolgirls in his presence or at the mere mention of his name, the Clintons and Vice President Al Gore began perfecting “pay-to-play” even before politicians and the denizens of U.S. newsrooms ever used the now cliched jargon. For example, President Bill Clinton’s FBI Director Louis Freeh, upon retiring from the nation’s legendary law enforcement agency, revealed that Clinton kicked the American people and the families of victims of the 1996 Khobar Towers terror attack in Saudi Arabia to the side of the road. In the wake of that Islamic terrorist attack, Clinton had promised Americans that he would do everything in his power to bring those responsible for the bombing that killed 19 and injured hundreds to face U.S. justice. But Director Freeh described how he and his counter-terrorism unit became angry when Bill Clinton refused to personally ask Saudi Crown Prince Abdullah to allow the FBI to place boots on the ground to question the terrorism suspects the kingdom had arrested and to at least visit the crime scene where Americans died horrible deaths. Freeh said, “Bill Clinton raised the subject only to tell the crown prince that he understood [Abdullah’s] reluctance to cooperate and then he hit Abdullah up for a $1,000,000.00 contribution to the Clinton Presidential Library.” Freeh said, “That’s a fact that I am reporting.” Freeh didn’t use the terms now common in political jargon, but basically the Saudi government paid Clinton a million dollars to forget about a thorough U.S. investigation of a terrorist attack that killed American citizens. The former top cop originally wanted to retire, but he later said he was determined to stay on as FBI director until President Clinton left office so that Clinton could not appoint a new director. “I was concerned about who he would put in there as FBI director because [Clinton] had expressed antipathy for the FBI [and] for the director. [So] I was going to stay there and make sure he couldn’t replace me,” Freeh admitted. In another pay-to-play scheme, in mid-1996, President Clinton created the White House Commission on Aviation Safety and Security and assigned it three specific mandates: to look at the changing security threat, and how the US could address it; to examine changes in the aviation industry, and how government should adapt its regulation of it; to look at the technological changes coming to air traffic control, and what should be done to take best advantage of them. In the wake of concerns over the crash of Trans World Airlines Flight 800, President Clinton asked the commission to focus its attention first on the issue of security. He asked for an initial report on aviation security in 45 days, including an action plan to deploy new high technology machines to detect the most sophisticated explosives. From its inception, the commission took a hands-on approach to its work. President Clinton announced the formation of the commission on July 25, 1996 and a few days later, Vice President Al Gore, commission chairman, led a site-visit to Dulles International Airport where he and other commissioners saw airport and airline operations firsthand, and discussed issues with front line workers. This was the first of dozens of such visits. Over the next six months, the commission visited facilities throughout the United States and in various locations abroad. The Gore Commission held six public meetings, hearing from over fifty witnesses representing a cross section of the aviation industry and the public, including families of victims of air disasters. Recognizing the global nature of aviation, the commission cosponsored an International Conference on Aviation Safety and Security with the George Washington University. More than 700 representatives from sixty-one countries attended. 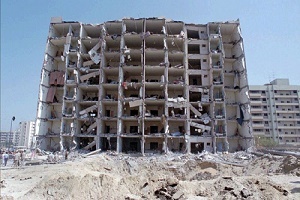 The remnants of Saudi Arabia’s Khobar Towers after a terrorist attack in 1996. Bill Clinton used the incident to get a $1 million donation from the Saudis. There were a number of recommendations made by the Gore Commission, whose commissioners included family members of the victims of Flight 800. The recommendations included several measures to improve screening company performance, including a national job grade structure for screeners/security officers and meaningful measures to reward employees. It also called for airlines to hire security companies on the basis of performance, not the lowest bidder. The Gore Commission also called for criminal background and FBI fingerprint checks for all airport and airline workers who screen passengers for weapons or have access to secure areas. The airlines industry had long opposed mandatory criminal checks. Two weeks later, as reported in the Boston Globe, Gore retreated from his own commission’s proposals in a letter to Carol B. Hallett, president of the industry’s trade group, the Air Transport Association. The day after Gore’s letter to the Air Transport Association, Trans World Airlines donated $40,000 to the Democrat National Committee. By the time of the presidential election, other airlines had poured large donations into Democrat Party committees: $265,000 from American Airlines, $120,000 from Delta Air Lines, $115,000 from United Air Lines, $87,000 from Northwest Airlines, according to an analysis done for the Boston Globe by the Center for Responsive Politics, which tracks donations. A total of $627,000 was donated to the Democrats by major airlines. Two of the commission members — Victoria Cummock and Kathleen Flynn, who lost loved ones in the terrorist attack on Flight 800 — believe that campaign contributions by the airline industry were a direct result of Al Gore backing away from the commission’s security recommendations. 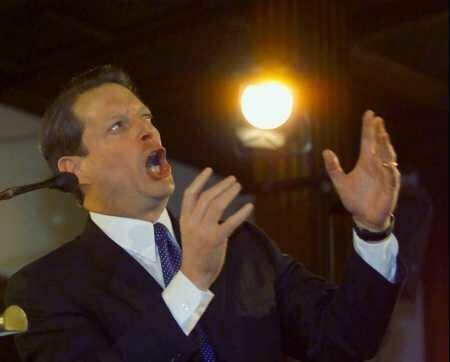 Don’t bet on the mainstream news media reminding Al Gore of this flagrant example of homeland security taking a back-seat to campaign cash the next time they quote one of his frequent fever-pitched rants. they don’t even know how to blush…. they are hardened criminals.